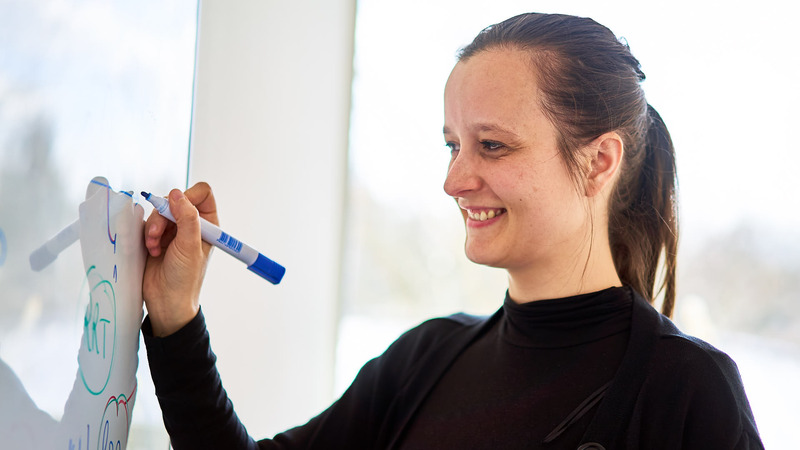 I am an EPSRC postdoctoral fellow and a lecturer at the University of Bath, where I am a member of the probability group Prob-L@B. Between 2013 and 2016, I was a postdoc at Prob-L@B, as part of Peter Mörters' EPSRC project Emergence of Condensation in Stochastic Networks. Between 2010 and 2013, I was a PhD student whithin the Laboratoire de Mathématiques de Versailles under the supervision of Brigitte Chauvin and Danièle Gardy. 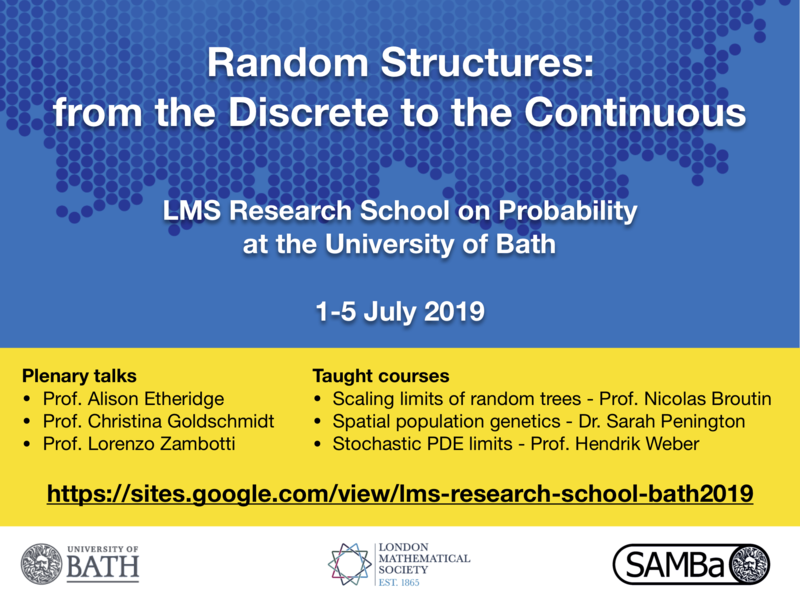 LMS Research School on "Random Structures: from the Discrete to the Continuous"
Workshop "Women in Probability" 2019, Technical University of Munich, Germany, May 31th-June 1st 2019. Rencontre ANR/SNSF MALIN, Les Diablerets, Switzerland, June 10th-14th 2019. SPA 2019, Northwestern University, Chicago, USA, July 8th-12th 2019. Cécile Mailler and Gerónimo Uribe Bravo. Cécile Mailler and Denis Villemonais. Cameron Smith, Cécile Mailler and Kit Yates. Nabil Lasmar, Cécile Mailler and Olfa Selmi. Journal of Applied Probability, 55(1), pp 254-281, 2018. Latin American Journal of Probability and Mathematical Statistics - ALEA, XV, pp 375-408, 2018. Nicolas Broutin and Cécile Mailler. Random Structures and Algorithms, 53(1), pp 15-58, 2018. Cécile Mailler and Jean-François Marckert. Electronic Journal of Probability 22, paper no. 26, pp 33 (DOI:10.1214/17-EJP47), 2017. I gave a talk on this work at the Workshop on Analytic and Probabilistic Combinatorics at BIRS (Banff, Canada); the video of this talk is available here. Steffen Dereich, Cécile Mailler and Peter Mörters. Annals of Applied Probability 27(4), pp 2539-2568, 2017. Jérémie Bettinelli, Éric Fusy, Cécile Mailler and Lucas Randazzo. Séminaire Lotharingien de Combinatoire, 77, Art. B77a, pp 1–24, 2017. Antoine Genitrini, Bernhard Gittenberger, Veronika Kraus and Cécile Mailler. Applicable Analysis and Discrete Mathematics, Volume 10(2), pp 408-446 (DOI 10.2298/AADM160715015D), 2016. Cécile Mailler, Peter Mörters and Daniel Ueltschi. Stochastic Processes and their Applications 126(11), pp 3283-3309 (DOI 10.1016/j.spa.2016.04.028), 2016. Antoine Genitrini et Cécile Mailler. Algorithmica 76(4), pp 1106-1138, 2016. Theoretical Computer Science, 570, pp 70-101 (DOI : 10.1016/j.tcs.2014.12.025), 2015. Brigitte Chauvin, Danièle Gardy and Cécile Mailler. Random Structures and Algorithms, 47(4), page 635, 2015. Brigitte Chauvin, Cécile Mailler and Nicolas Pouyanne. Journal of Theoretical Probability, 28, pages 923-957, 2015. Electronic Journal of Combinatorics, 19, No. 2, P37 (electronic), 2012. No Shannon effect induced by And/Or trees. Antoine Genitrini, Bernhard Gittenberger et Cécile Mailler. In proc. 25th International Meeting on Probabilistic, Combinatorial and Asymptotic Methods for the Analysis of Algorithms (AofA'14), DMTCS, pages 109-120, 2014. Equivalence classes of random Boolean trees and application to the Catalan satisfiability problem. Antoine Genitrini and Cécile Mailler. In proc. 11th Latin American Theoretical INformatics Symposium (LATIN), LNCS volume 8392, pages 466-477, 2014. The growing tree distribution for Boolean functions. In proc. 8th SIAM Workshop on Analytic and Combinatorics (ANALCO), pages 45-56, 2011. Random Boolean Trees and Pólya Urns: Combinatorial and Probabilistic Approaches. Defended on October 17th, 2013. Exercises sessions of Brigitte Chauvin's course "Random trees for analysis of algorithms" at the BMS Summer School 2011 -- 2011, Berlin. The monkey walk: a random walk with random reinforced relocations. King's college workshop on random graphs and random processes, King's college, London, April 9th 2019. Zurich's seminar on stochastic processes, Zurich, October, 2018. 672. WE-Heraeus Seminar "Search and Problem Solving by Random Walks", Bad Honnef, Germany, May, 2018. Stochastic approximation on a non-compact space and application to measure-valued Pólya processes. UK Easter Probability meeting, Sheffield, April, 2018. Séminaire de Probabilités de l'Institut Élie Cartan, Nancy, France, November 9, 2016. Non-extensive condensation in reinforced branching processes. Fourth Bath-Paris Branching meeting, June 28, 2016. Probability seminar, Cambridge, UK, January 26, 2016. Probability in the North East (PiNE) seminar series, Sheffield, UK, January 27, 2016.